St. John's Prep and BC High currently hold two of the top three spots in our latest projection. The arrival of Sunday of Memorial Day weekend means there is exactly one week until the Division 1A "Super Eight" committee convenes in Franklin to decide the eight teams that will compete in this year's Super Eight tournament. As it stands now, this very well could be the most unpredictable field yet. Mansfield’s play over the last three weeks has put them in competition not just for a spot in the field but a potential home game, while Andover has made its way into the conversation. Xaverian and Catholic Memorial’s chances each took a bit of a hit with losses over the weekend while Austin Prep continues to prove that is deserving of serious consideration. Any of St. John's Prep, Wachusett, and BC High could compete for the top spot over the season’s final week, but after that it seems to be anyone’s guess as to who lands a berth in the 2018 Super Eight field. With one week to go, here is SuiteSports’ MIAA Super Eight Projection 3.0. We will release our fourth projection on Thursday, May 31st before releasing our final projection one week from today. Overview: St. John’s Prep remains in the top spot after coming from behind to knock off Swampscott courtesy of a Tyler MacGregor walk-off single. The Eagles have a bevy of arms and as quality a top of the lineup as there is in the Bay state. One interesting matchup for St. John’s comes at the end of the week when they take on red-hot St. Peter-Marian. As long as they win their first two matchups of the week it’s hard to see the Eagles not receiving one of the top three seeds. Overview: The Mountaineers continue to pound out the runs as knocked out eight in a win over Algonquin to go with a 15-6 victory over Grafton. Jake Gigliotti has done his job as the staff’s front of the rotation man while Mike Maher, Francis Ferguson, and Eddy Beauregard highlight an exceptional lineup. One final test remains versus St. John’s Shrewsbury on Thursday, but one way or another Wachusett looks in line to host a Super Eight game for the first time in the tournament’s five-year history. 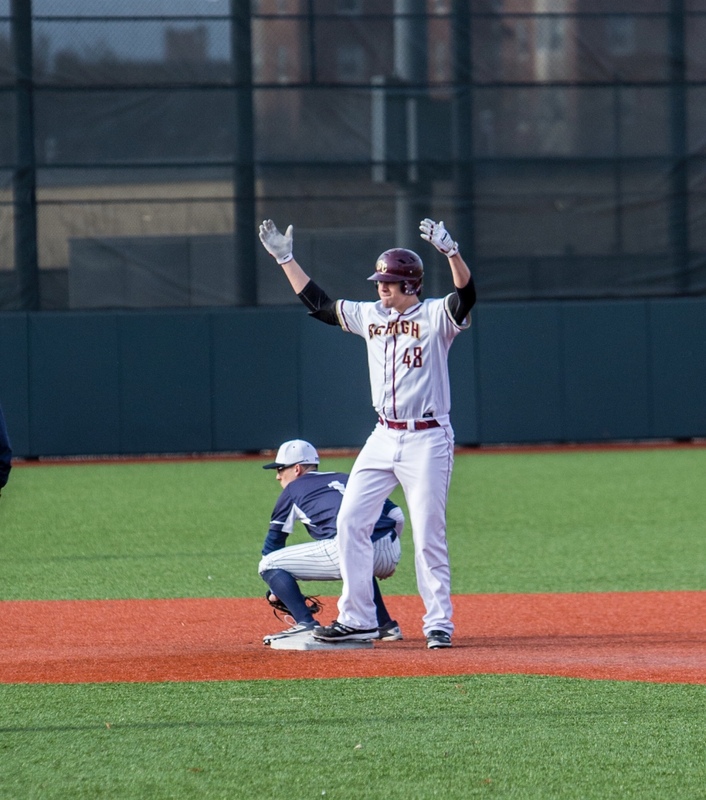 Overview: The return of Mike Vasil could not have gone better for BC High as the Eagles’ ace threw four innings of shutout baseball en route to a 4-2 win over St. John’s Shrewsbury. BC High followed that up with double digit run wins over Silver Lake and Chelmsford to move into the number three spot in our latest projection. The Eagles now have six kids hitting above .300 highlighted by outfielder Matt Sullivan and second baseman Pat Roche. As long BC High can win two of its final three versus Cheverus (ME), Lowell, and Malden Catholic they should be in line for a top four spot. Overview: The Hornets continue to surge and now find themselves in the four slot in our latest projection following a dominant 8-1 win over Walpole on Friday afternoon. While we find spots four through eight fairly wide open at this point, Mansfield has started to separate itself from the pack with its front of the rotation highlighted by Kevin Dow and Tyler Dalton and the fact they have now won 14 games in a row. As long the Hornets can win their final game of the season versus King Philip, it would be surprising if they did not secure one of the eight spots. Overview: The Raiders hang on to the five spot as they enter their final three games of the season with a respectable 12-5 record. They have a quality win over Austin Prep as well a 1-0 win over Andover, but have seen their lead in the Merrimack Valley Conference’s large division slip away at the hands of the surging Golden Warriors. Steve Hajjar has continued to be lights out on the mound but the Raiders at times have struggled to score runs. If Central Catholic can win its final three it will be a comfortable selection Sunday, but it sure is shaping up to be a “win-and-get-in” situation when the Raiders and Andover face off on Saturday. Overview: Lexington looked like they may fall out of the picture altogether when they fell to Catholic Memorial on Monday, but the Minutemen bounced back with much needed victories over Waltham and Wellesley to stay in our latest projection. Once again on Thursday, Sal Frelick stole the show drilling a towering three run home run in the Minutemen’s 11-3 win over the Raiders. Even with two wins to close the season there is no guarantee they will land a spot, but we feel pretty good about where Lexington stands at the moment. Overview: St. John’s Shrewsbury had a difficult start to the week, first falling to BC High on Tuesday before losing to Shrewsbury in crushing fashion on Wednesday. Facing a must win game on Friday to stay within the top eight the defending champions responded with Tom Moschella hitting the game winning grand slam in the top of the seventh inning. Heading down the stretch the Pioneers are sure to be an interesting case as they battle injuries to a number of key players but if they can grind out a win over Wachusett on Tuesday they should get a chance to defend their crown. Overview: Back in 2016, Austin Prep became the first Div. 3 team nominated for a Super Eight spot. Two years later and the Cougars are doing everything in their power to now become the first Div. 3 team to earn a Super Eight nod. Outside of a 4-0 loss to Central Catholic and ace Steve Hajjar, Austin Prep has been just about flawless knocking off every team in its path. Peter Burns is rock solid behind the dish and him, Logan Bravo, Dylan Arnold, and Colin Jaena carry the load at the top of the lineup. Cam Seguin, Jeana, and Andrew Croteau spearhead the pitching staff. Three tall tasks are ahead including against Reading and Belmont, which means Austin Prep will definitely have a chance to prove its worth.